Outdoor furniture doesn't have to be costly if you know how to shop for a bargain. So where do you go, when do you shop, and how do you find what you want, for less? These are a few simple ways to go about saving, for those who want to know how to save money on outdoor furniture this summer. 1. Catalogue it - Yes, you can finance your purchases via catalogue shopping. There are many specialty sites you can visit. Not only can you pay off the purchase over time, you can avoid interest rates if you pay within a certain introductory period. Further, the more you buy, the longer you have to repay, and the more you can spread the cost out. 2. Consider second hand - If you swap with friends, buy second hand, or find local shops which sell previously, lightly used pieces, you can really save as well. Doing this is a simple way to pay less for the same exact item you would pay full price for. And, in many cases, stores sell items which were returned (but not used) for a fraction of the price they would cost new. 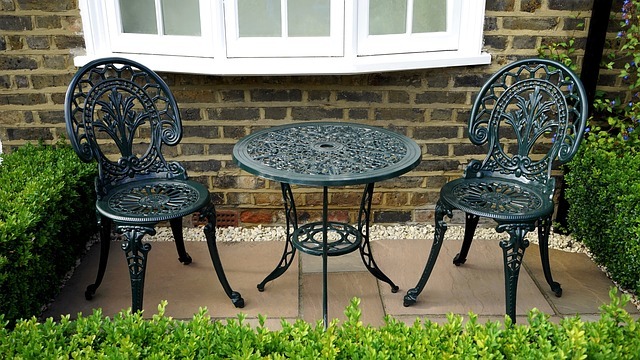 Second hand garden furniture is a great way to save some money this summer. 3. DIY it - If you love doing it yourself, this is your chance. Buy an older item, and refurbish it. Paint it, add your own linen seats, consider doing something unique. Not only is it one of a kind, it is also going to be a much cheaper option than buying all furniture brand new. 4. Double up - If there is a shed you have, or a seated tool box, you can use one item for furniture and storage. Outdoor tables with built in cabinets. Seating with below storage area. These items can be utilised in more than one way, and you can save on storage solutions as well as the cost of furniture you are going to buy. 5. Make it - If you are handy, you can build your own furniture. Yes, buy the actual wood, linen, seating, and other necessary parts, and build it. Like DIY jobs, you are putting your own touch on things, and it will cost far less than buying items brand new from stores. With summer season here, you want to enjoy your outdoor space. If you are looking for new outdoor furniture and sets, but do not want to spend the high cost on buying it new, these are a few ways to spread costs, and save on the pieces you buy or make.